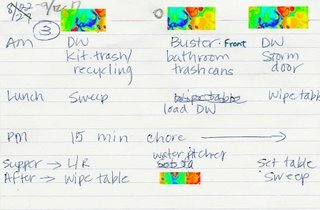 I thought I'd post how I divide up daily chores for our big kids (ages 8-12) around here. We started this system when they were 6, 9 and 10. Big kids are responsible for their daily jobs - self-care and room. But there are a few things I need help with that I just had trouble keeping track of who did what, when. We've tried various things, but now we follow a weekly rotation. This seems to work best for us. I made three cards (4x6, what else?) - one for each week, three weeks because there are three kids that get rotated. The stack of three gets poked with the nail that holds our kitchen calendar with the card for that week on top. We rotate every Sunday. Here are all three cards in a row. 1. I numbered the weeks because the cards occasionally fall off (or get "removed") from the wall. 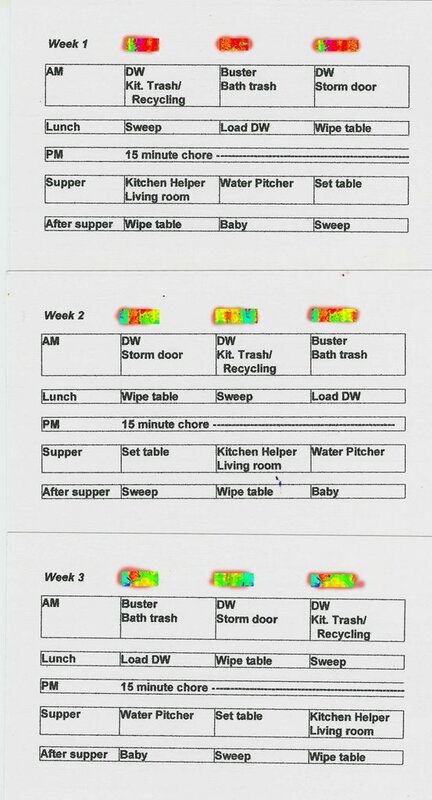 This way I can remember what order the chores are supposed to go in. 2. Buster is our twelve-year-old yellow lab who likes to be fed regularly. 3. DW - this means unload dishwasher. Two kids share this job. With three kids, they will do this job two weeks in a row. 4. 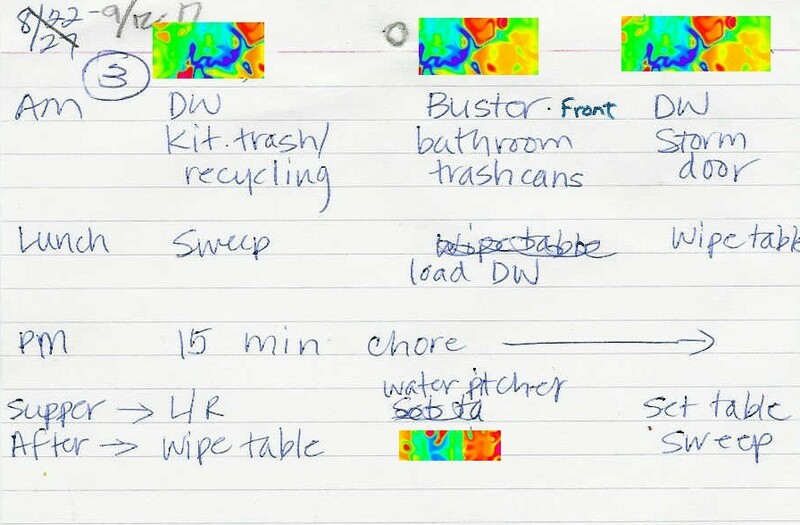 The 15 minute chore is not a set thing (I'm not that organized). But the kids know that I wield the power to ask them to do something for the benefit of the family during the day. Some things include: Vacuum a room, bring laundry to laundry room, scoop back yard, clean small bathroom, give Cowboy the Schnoodle a bath, mop kitchen, etc. Sometimes I will give them a list - on a 4x6 card, of course. 5. Living room - this means straighten living area before Dad gets home. Everyone is "supposed" to keep up with their stuff in living areas, but we fall WAY short in this area. This person is to remove debris to its appropriate room. 6. Sweep - Kids are ridiculously bad at sweeping. I got a cheap battery-powered sweeper that gets the big crumbs out from under the table so even my five-year-old can do this. 7. Whoever feeds the dog for the week gets to ride "shotgun" in the car. All week. One more argument averted. 8. If someone is absent for their job, someone else gets asked to do it (or I do it). Their replacement knows that someone will "cover" for them when they are gone, and it is not a point to be argued. 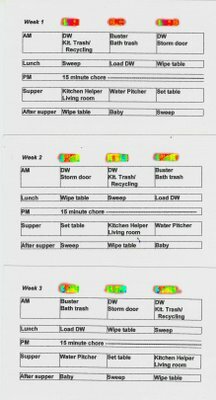 Our five-year-old usually begs for a chore, so she regularly fills in for absentees. I suppose I'm going to have to make a fourth card to include her, soon. 9. After supper, everyone helps clear the table. Do all these jobs get done perfectly every day? I think you know me well enough to answer that. Of course not. But it gives us a framework for assigning jobs that benefit the family, and relieves me of some small tasks that, all together, overwhelm me. I love WFMW because it makes me clean things up. Until yesterday, my cards had looked like this for the past two years! 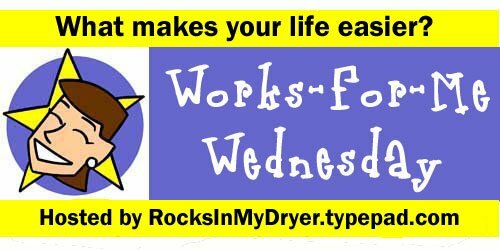 Be sure to stop in at Shannon's to see the rest of the WFMW tips! Great ideas! Ours is up as well, have a great Wednesday! Katherine, you are an oranizing superhero. My goodness you need to write a book. I like this idea of the cards. In my household I have to think of something different for when someone's not around to do thier turn on dishes 'cause my 16yr old is inlvolved in way more things than her siblings and therefore misses her turn during on season regualarly! Beautiful site. I'll have to come back so I can get caught up with you. I like what you have to say and how you say it. Great tip! I'll keep this in mind when our current systems starts to falter. Terrific! I'm working on getting my 7 year old to do chores regularily - I'll see if this works for her. Katherine, I love it. Let me tell you when a mom of five gives me a tip on how to manage chores you can bet I'm going to listen. Currently I use a similar system but I've been writing on a white board which means I have to rewrite it every week. I will be stocking up on 4x6 cards because did I tell you I LOVE it!!! This inspires me. Removes the whole aura of 'nagging'! This is great! I love the "shotgun" idea--that can work for me. I also require not only "self care" chores but also "whole family" chores for my big kids. The 4-year-old generally gets assigned to help a Big Kid or helps me fill out outdoor bird feeder. Hey--I like this. We have a similar system, but I like the card bit. i desperately need to get more organized as far as chores go. my kids are getting big enough to really help.